Some of the links below are affiliate links. Thank you for using these links and supporting Southern & Style at no additional cost to you! Two Monday's ago was a big day, y'all! I had a doctor's appointment that afternoon to check on our little guy (who is doing great, by the way!) and my mom and sister, Julie, tagged along. After my appointment, we met up with my oldest sister, Trystan, for a little window shopping at the Summit and then dinner at Bar Taco (my fave). She had planned a belated birthday surprise for Julie, Mom, and I (since our birthday's all fall in the same week in June) and it turned out to be a cooking class at Sur La Table! We took a cooking class last year for my mom's birthday and this year's was so much fun as well-we ended up making crepes with an orange sauce; delicious! I highly recommend taking a cooking class if you've never done it before, they're so much fun and you walk away with new skills and recipes. If y'all aren't following along on my Facebook page for Southern & Style, you're really missing out! I don't just post my blog posts when they go live (although, I do that too), I share fun articles that I read around the internet, but my favorite thing to share are #SaleAlerts of items I find around the internet that are great deals from some of my favorite retailers. These will get more frequent as Christmas approaches because I love to get my shopping done early, if I can! I also am just one follower away from 200 followers, so I'll be planning a giveaway soon...so be on the lookout for that and follow along for a chance to win! My sister, Trystan, did our invitations (aren't they absolutely beautiful?!) as well as some chalk art for the shower and y'all-if you need anything done, I'll say it a million times-she's fabulous. Her Etsy is SouthernScrawledShop & she has done tons of custom stuff for me, she would love to do it for you too! My sweet husband even dropped by at the end of the shower to help us load our presents up & take them home. It was the best day with my family and sweet friends, we felt so much love & I can't wait to bring our little guy into this fun group! 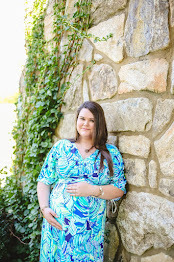 It's the best "maternity but not" dress and I love, love, love how it fits. There are a ton of great sales right now & it's honestly the perfect time (like I said in 2), to stock up on gifts for birthdays or Christmas! Zulilly is one of my favorite sale sites to shop, because they host flash sales on great brands. Fiestaware (my favorite brand of dishware!) is currently up to 40% off there for the next three days, as well as tons of your favorite lipstick brands (like Nars, Bobbi Brown, Smashbox, etc.) are up to 50% off until tomorrow! Don't mind me-I'm just daydreaming over here about the day when we finally get to sell our house in town & move out to the farm...currently, my favorite house plan is this one by Southern Living, minus finishing the upstairs-that's something that could always just be roughed out & then finished later if we needed more space! If you missed Saturday's post, I chatted all about the fun shoes I've been seeing all over the internet. 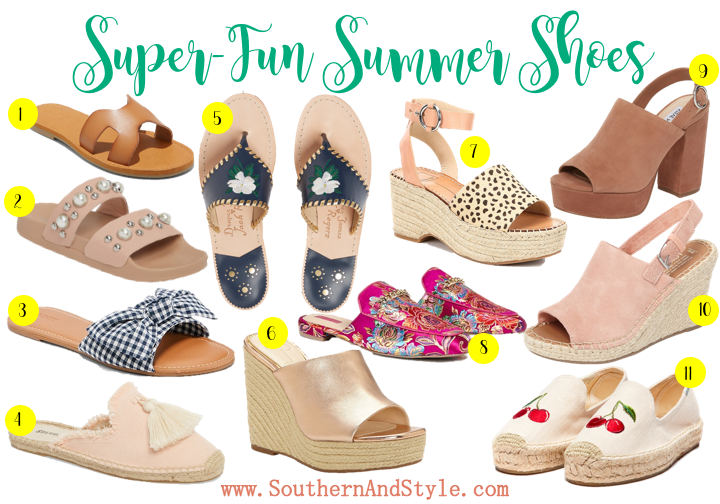 It definitely still feels like Summer here in Alabama & probably will until the end of September or into October, so I shared my favorite Summer shoes and mentioned briefly how I would style them into the Fall-so many of these shoes can be worn into Fall! And bonus, a lot of them are on sale right now. Does anyone else really love when Lay's comes out with new crazy chip flavors? Right now I'm highly anticipating cajun spice and chile con queso! 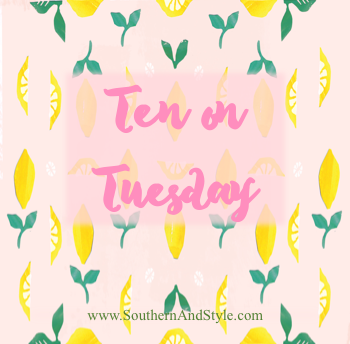 I haven't shared a dedicated Nordstrom sale post with y'all-mostly because everyone else is doing it and I don't think y'all need another blogger shoving it down your throat...but every now & then I do like to share a pick or two of something I find to be a good deal. This Kate Spade necklace is $16 off (formerly $48, now $32) which isn't a ton, but I definitely think it's a good buy. I love the idea of an initial necklace, especially as a new-mom-to-be, I would gladly wear one with my little babe's new initial on it! 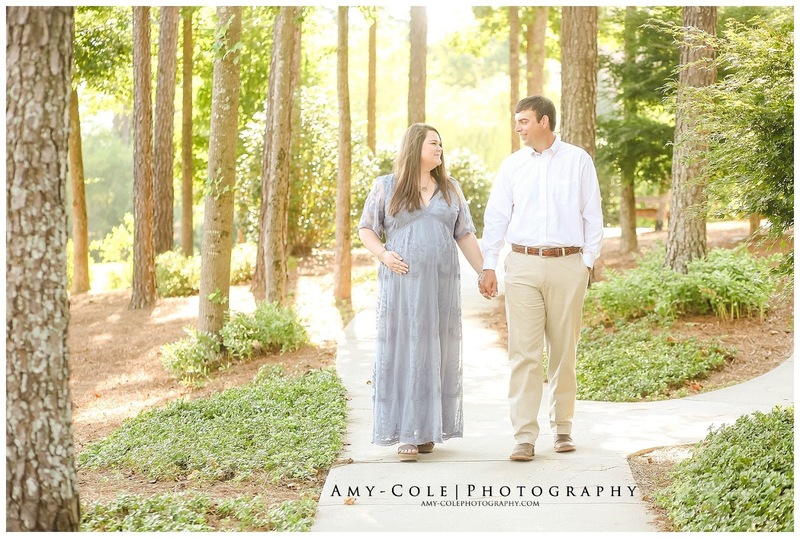 On Sunday my husband & I hopped in the car and made the two hour drive North of Atlanta to see our favorite friend, who also happens to be an amazing & magical photographer-Mrs. Amy Sullins! She's been there for us from our engagement, to our wedding, my graduation, our first anniversary, and now our maternity photos! Good-Lord willing, she'll be there to capture the birth of our sweet baby boy & his newborn photos as well. I can't imagine anyone else I'd rather have to help us document our lives...plus she keeps us on our toes laughing! I mean, just look at this sneaky-peeky image that we already got on MONDAY after a SUNDAY shoot-she's good, y'all. That light is so dreamy. Ironically, the one thing that is my all-time favorite that I purchased during the Nordstrom sale wasn't even on sale...typical for me, haha! I bought myself a cozy robe because I know I'll be pretty much living in cozy clothes after the baby comes and this one is already a winner. It's my favorite thing to wear in the mornings while I fix Chris breakfast and then before bed, too. Even though I'm trying to abstain from anymore personal shopping (because furnishing a nursery and buying things for babies is expensive, y'all!) I can't help but browse with all of the summer sales going on right now-they're all so good. So I decided to throw together a guide of some of my favorite summer shoe finds, just in case some of y'all were still on the hunt for a new pair. Bonus-so many of these will transition beautifully into Fall! If you were obsessed with the Hermes Oran Sandals, but couldn't stomach the outrageous price tag...then these sandals from Target's Universal Threads line might be more in your price range. These classy sandals are only $20 and come in cognac (shown in the graphic), black, and white...and heck-at that price you can afford to get all three! These are the perfect casual slide, plus you can wear them to the pool and not worry about them getting destroyed. They also come in at less than $25 so they're easy on your wallet. Reviewers say to size up at least one size, as they run small-but they come from Nordstrom, so shipping & returns are always free! Can y'all believe I only included one gingham option on this post? Honestly, I can't either! Gingham is one of my favorite prints & I am so lucky to live in the South, where I could wear these sandals well into October and still be comfortable. These are currently $15 (what?!) and come in this pretty gingham as well as a striped chambray. Wear now with shorts and into Fall with a skinny jean. 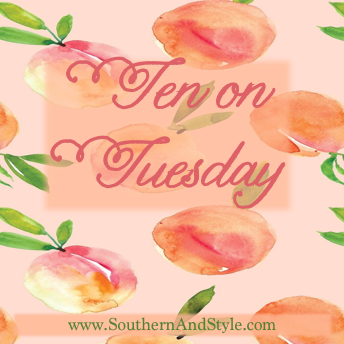 The color blush was trendy in Spring, held strong in Summer, and I'm pretty sure it's going to last through Fall as well-it's that good, y'all. If you haven't shopped the Nordstrom Anniversary Sale, these shoes are part of it & are currently in stock in all sizes. Two of the most quintessential Southern brands came together to collaborate and these sandals are some of my favorites from that collection-the magnolia blossom is just so classic. The navy color will also match with almost anything, so feel free to wear them at will! If you haven't gathered it from the image above, espadrilles are very popular for Summer going into Fall. These rose gold wedges are under $50 & can completely be dressed up for date night or dressed down to wear during the day. If I'm going to wear a high shoe of any sort, it's going to have to be a platform these days. These platform espadrilles are so cute with their leopard print, but everything else is neutral meaning you can style these however you want. I'm thinking they would be perfect right now with a dress and then wear them into Fall with some trendy bell-bottom jeans! This Forever21 find is a steal at under $25; don't they give y'all all the Gucci loafer vibes?! These will be perfect for transitioning into the cooler months, while still giving a pretty pop of fuchsia. These trendy platforms are a part of the Nordstrom Anniversary Sale, making them less than $75 right now. That's a great buy on a shoe that will be trendy into Fall. They come in black & tan, I can't decide which ones I love the most. They just have the perfect flirty seventies vibe that makes me want to wear them with a short denim skirt and a bell-sleeved top (but hello, I'm past those days 😂). Another blush option, these pretty wedges are from the TOMS brand which I've always found so, so comfortable. Luckily for y'all that want to wear these into Fall, or just aren't blush fans-they also come in black & pine (which is an olive shade). They're also 30% off right now which makes them an excellent deal! Draper James always has the cutest items in their collections, don't they?! These darling smoking slippers are perfect for tossing on & running errands or for an afternoon date. These are a tighter fitted shoe, after wearing once you'll have a custom fit due to the tailoring and materials used. Which pair are y'alls favorite?! I really love 7 & 9 the most I think-they're perfect transition shoes into Fall! So many things have been going on lately, I haven't even given y'all a life update since May. We've had so many things going on in our lives on the farm, getting ready for baby, etc. A big part of our lives since I stopped teaching is obviously the farm since it's both of our "full-time" jobs. 'Tis the season around here for weaning our calves, so we've had a lot of early mornings getting ready to do that. It's a little annoying when you're getting up, but that sunrise view makes it a little bit better. Driving the tractor with Forrest leading the way is how we get the cows moved from the various pastures they're in, to the barn where weaning will take place. This little guy was checking me out while we were unloading back at the barn. A gorgeous golden hour shot of our girls, since I'm back on checking cows duty once or twice a day. We recently purchased a new big truck for our hauling business and Chris took me for a ride! He took our niece and nephew for a ride as well and they loved honking the horn. A lot of people don't understand our farming way of life because they never see it up close. Another fun thing that's happened over the past month & a half was being able to spend some quality time with our niece and nephew. Lola went for a tractor ride with Uncle Chris to bale hay and loved it-I just melt seeing them together! We took them and our favorite puppy boy, Forrest, for a hike at High Falls. We all loved doing it together-especially the kids and Forrest, who all got to take a swim in that little natural pool behind us at the base of the Falls. To end the weekend with our niece and nephew, Lola snuck off with us and ended up going for a little boat ride with Uncle Chris. This shot is him showing her some fish swimming beside the bank. Oh, Williams-Sonoma, why you gotta tempt me this way?! If y'all have been following along for some time now, then you probably know my affection for ginger jars in all shapes, sizes, and colors. This one from Williams Sonoma caught my eye last week and it's now on my permanent wish list (where it will probably remain forever because of the price tag!) but that color is just so different & beautiful! I mentioned in the last life update that I did, our anniversary was the 30th of May plus my birthday was the 13th of June. Chris took me to my all-time favorite restaurant, Acre in Auburn, AL for a romantic dinner. They have an amazing "Urban Farm" where they grow a lot of their vegetables on site, but they also have a great program with local farmers to source their other produce, meats, etc. 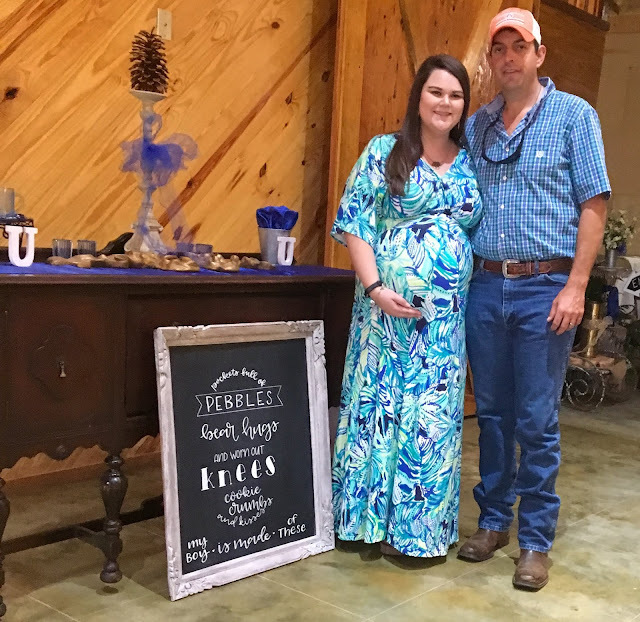 The meal was incredible and I'm hoping I'll be able to convince him to squeeze in one more meal there before this babe comes! 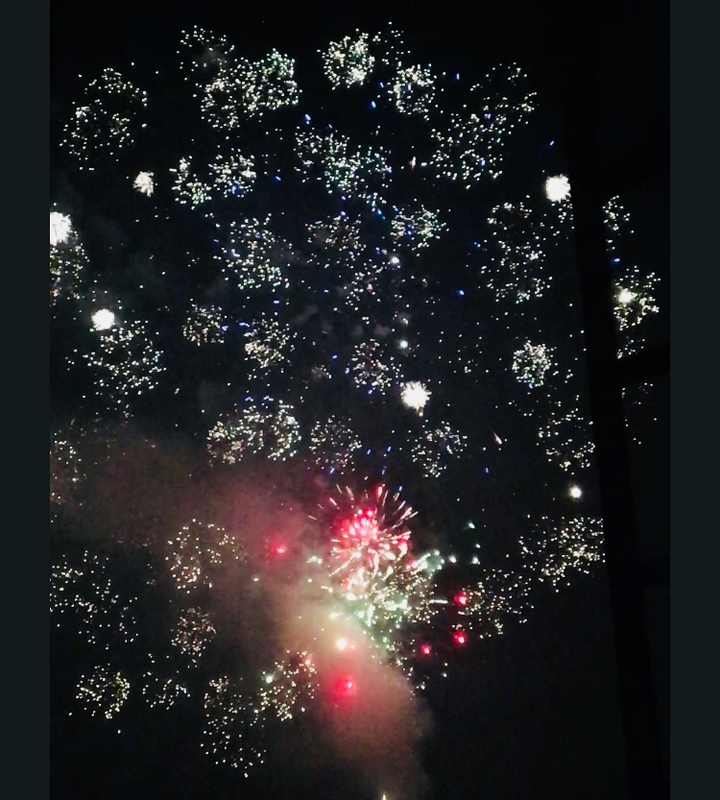 Our Fourth of July was absolutely wonderful. We have some of the best friends, the Thompson's, that have a lake house and are always so kind to welcome us there during the Summer months. It's just one of my most favorite places on Earth, so calming and rejuvenating-plus those friends of ours are just some of my favorite people! Of course, we couldn't not take a boat ride & end our day with the most beautiful fireworks show from the dock-you can't beat that view! Another not-so-fun thing that has kept me from blogging is that we lost my Daddy's mom, our Maw-Maw just a few weeks ago now. When Chris & I went over to my parents to look through photos for the slide show for her memorial, I found this gem of us "smoking" cookie cigars-she certainly was a character that kept us all laughing! Just in case you missed it, I did blog Saturday about what I've been reading lately. I got really honest with y'all & explained that I've actually read three & a half books but I hated one of them so much I didn't even want to review it here and the other I stopped not even halfway through and tossed it in the donate pile because I just wasn't interested. Influenster is one of my most favorite apps/sites to use both as a consumer and as a blogger. I was recently sent these Marc Jacobs lip gloss sticks in Sweet Escape and Uh-Huh Honey and y'all, they are so good I've raved about them to anyone that will listen. They're lightly hydrating, not sticky like normal lipgloss and the colors offer the perfect wash of color for every day. If you'd like to get freebies from Influenster (you don't have to be a blogger-you just have to have social media like Facebook, Instagram, or Twitter to qualify!) then sign up through this link and you'll be able to qualify for free makeup, food items, household items...basically the sky is the limit! This section is just going to be kind of a dump of some pictures that I wanted to share from my phone to y'all. . .
My sister, Mama, and I have been scouring antique stores for finds for not only the house, but the baby's room specifically because even though it is a nursery it's still a part of our home and I want it to fit. We decided to not go with white because that felt too feminine, but you best bet that if we ever have a little girl I'm going to pray to find beautiful antique furniture like this one for that room. Our foyer has gotten a mini facelift by adding this arched mirror from Kirkland's. It really gives that space a finished look & brings so much light into that area-I love it! I haven't had many pregnancy cravings, but one major one has been fried green tomatoes...y'all-they are so addictive! I haven't fried any in about a month now, but it's on my to-do list for this week. Have you seen the Lilly Pulitzer X goop collection?! Just another beautiful view to end this life update/Ten on Tuesday from one of our local date nights on Lake Wedowee. The cotton candy sky reflecting off the of the lake was just beautiful over the marina, basically just the lake is a favorite for Summer. Let me know; what's been going on in your life lately or what are some of your favorites? !